Imagine standing on the roof of a building in Los Angeles and trying to point a laser so accurately that you could hit a particular building in San Diego, more than 100 miles (160 kilometers) away. This accuracy is required for the feat that a novel technology demonstration aboard the soon-to-launch Gravity Recovery and Climate Experiment Follow-On (GRACE-FO) mission will aim to achieve. For the first time, a promising technique called laser ranging interferometry will be tested between two satellites. GRACE-FO, scheduled to launch May 19, carries on the rich legacy of the original GRACE mission, which launched in 2002 on a planned five-year mission and concluded operations in October 2017. Among its insights, GRACE transformed our understanding of the global water cycle by showing how masses of liquid water and ice are changing each month. The mission also added to our knowledge of large-scale changes in the solid Earth. GRACE-FO will provide continuity for GRACE's landmark measurements for at least another five years, further improving scientific understanding of Earth system processes and the accuracy of environmental monitoring and forecasts. GRACE obtained its data on the movement of Earth's mass by precisely measuring slight changes in the distance between two spacecraft that flew one behind the other around Earth. When the satellites encountered a change in the distribution of Earth's mass—such as a mountain range or mass of underground water—Earth's gravitational pull on the spacecraft changed the distance between them. The Himalaya Mountains, for example, changed the separation distance by about three-hundredths of an inch (80 micrometers). By accurately calculating each month how the satellites' separation distance changed during each orbit and over time, it was possible to detect changes in Earth's mass distribution with high precision. 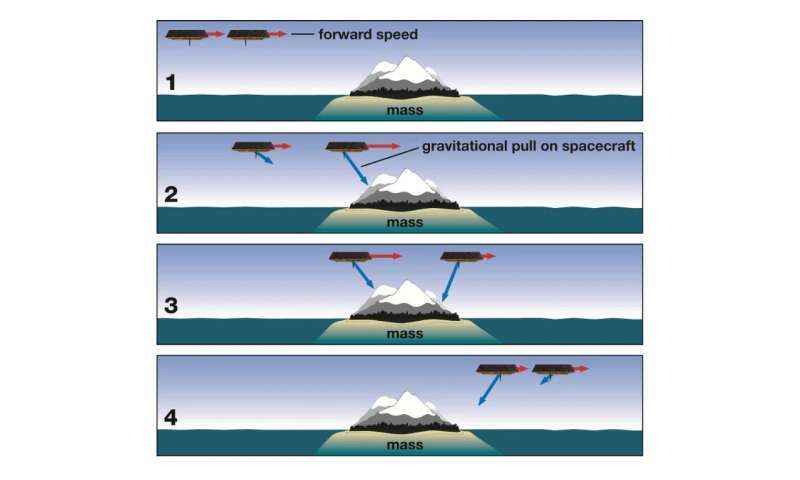 Measuring the change in the separation between the spacecraft was possible to a high degree of precision because each spacecraft was transmitting microwaves toward the other. The way the waves interacted with each other—the way they interfered with each other—created a microwave interferometer in space. This process essentially transformed the two spacecraft into a single instrument that could very precisely measure the distance change between them, which in turn can be related to changes in the mass distribution on Earth. GRACE-FO works on these same principles. Each spacecraft again carries a microwave instrument to track changes in the separation distance. But GRACE-FO also carries something new: a technology demonstration of a laser ranging interferometer (LRI), jointly managed by NASA's Jet Propulsion Laboratory in Pasadena, California, and the Max Planck Institute for Gravitational Physics (Albert-Einstein Institut) in Hanover, Germany. In addition to transmitting microwaves between each other, the GRACE-FO satellites will shine lasers at each other. Since the wavelengths in a laser beam are significantly shorter than microwave wavelengths, the laser ranging interferometer will improve the tracking precision of separation changes—just as measuring in millimeters instead of centimeters would be more precise. GRACE-FO's interferometer will detect changes in distance more than 10 times smaller than what the microwave instrument detects—changes on the order of 100 times narrower than a human hair. "With GRACE-FO, we're taking something cutting-edge from the lab and making it ready for space flight," said Kirk McKenzie, the LRI instrument manager at JPL. "The reason we spend decades working in the lab is to see our technology enable a new type of measurement and result in scientific discoveries." Each GRACE-FO satellite will be able to detect the laser signal of the other. But this is no easy feat. Each laser has the power of about four laser pointers and must be detected by a spacecraft an average of 137 miles (220 kilometers) away. Even the ultra-precise assembly of the satellites isn't enough to guarantee the laser transmitted from each spacecraft will be aligned well enough to hit the other spacecraft. As a result, McKenzie explains, the first time the laser ranging interferometer is turned on, the components of the LRI on each spacecraft need to perform a scan to send out the instrument's signals and try to "catch" the other's signals in all possible configurations. The spacecraft have so many possible configurations, it takes nine hours. For one millisecond out of those nine hours, there will be a flash on both spacecraft to show that they're talking to each other. After this signal acquisition occurs once, the interferometer's optical link will be formed and then the instrument is designed to operate continuously and autonomously. "We're trying something that is very hard—the first-ever demonstration of laser interferometry in space between satellites," said Gerhard Heinzel, the instrument manager at the Max Planck Institute. "But it's very satisfying to puzzle over a problem and find something that works." The difficulty of the task required tapping different areas of expertise. 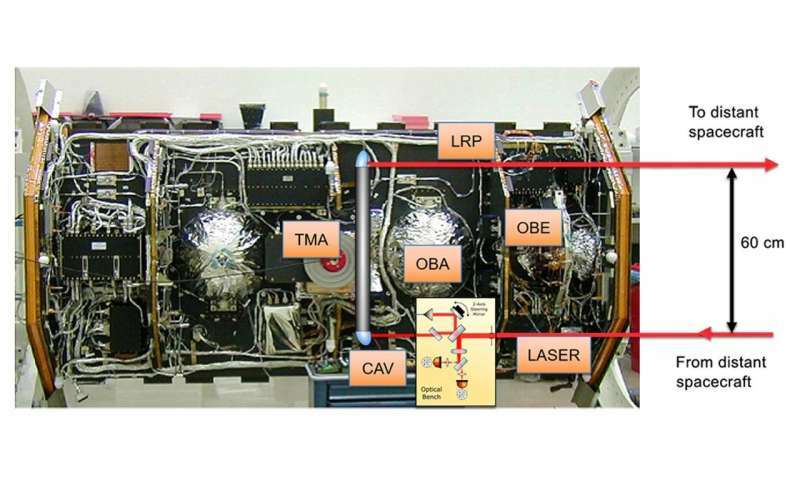 JPL oversaw the laser on the interferometer, measurement electronics and optical cavity. The Max Planck Institute was responsible for the optics, detectors, mirrors and beam splitters. The GRACE-FO laser ranging interferometer also took advantage of the two groups' 15-year-long history of collaborating on the technology behind the ESA/NASA Laser Interferometer in Space Antenna (LISA) mission, which will launch in the early 2030s. "The laser ranging interferometer on GRACE-FO is potentially an enabling technology for future missions around Earth or even to look at the universe," said Frank Webb, GRACE-FO's project scientist at JPL. "This new, higher precision measurement should enable more efficient missions in the future with lower mass, power and cost. We're eager to see how it performs and what new signals we might be able to tease out of the data."